Egg Robot Momo, the offspring of a chicken robot and a human robot, knows he is different from all the others. 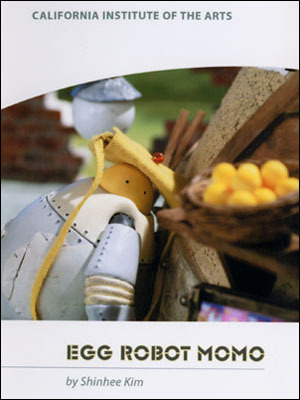 Synopsis: Egg Robot Momo knows he is different from all the other chicken robots. One day he goes to school wearing a fake beak and a tail that he made. 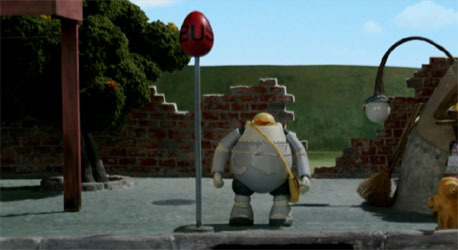 When the little chicken robots see him at the school bus stop, they ignore him as usual. A school bus picks up the chicks and leaves. Momo is left alone on the street. HIs stepfather looks upon the despondent Momo and decides to cheer him up with a hand puppet show. The show is a real story about Momo's parents. According to the story, his mother is the most popular soprano in the chicken robot world. While visiting the human robot world for a recital, Momo's mother met his father and fell in love with him. Later, she found out that she was pregnant and dumped the egg into a dark alley for the sake of her reputation. 'The egg rolled to this newsstand. That egg was you,' the stepfather says. Momo goes to meet his mother. His mother cannot recognize her son and leaves. Momo gazes at her limousine pulling away. Inside of the limousine, she suddenly turns around to look at Momo. The next mornig, Momo goes to school. The little chicken robots ignore him again. However, this time Momo doesn't care about them and takes the bus. On the other side of the street, Momo's mother watches from her limousine as her son gets on the bus. Momo's stepfather closes his store windows, smiling with satisfaction.